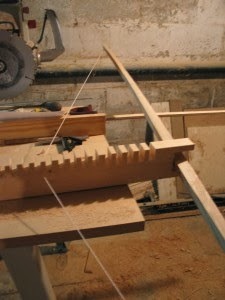 If you want to become a bow maker the first step you need to do is make a tiller. A tiller is a very commonly used tool in bow making, and it isn't really sold in shops that much. If you go to a store and ask for a tiller they will think you are looking for a motorized gardening tiller - which is NOT what you are looking for. They might even think you are looking for a tiller for steering a boat, which again is NOT what you are looking for. The more formal name is a tiller stick, and it is a horizontal piece of wood used during the crafting of a stave into a bow so that both sides of the bow are bending evenly. As such it is basically a mandatory tool that you will need if you want to try your hand at bow making. It is possible to build a bow without a tiller stick, but if you want it to be a good quality bow then my advice is to definitely make one before you even begin your bow making process. I made the tiller above out of a piece of poplar. For a tiller you don't need to worry about the quality of the wood so much. Cheap poplar is quick and easy to work with. Took me less than half an hour to make it. To make it I cut a 34 inches long piece of wood out of a larger piece purchased from Home Depot. I then drew on the dimensions of the tiller, the rectangle at the end where a bow can be placed, the indent along the side, and the 2 inch spaces for pulling back the bowstring during the tillering process of making the bow. Some people may prefer 1 inch between each notch on the their tiller, but I opted for 2. My tiller is set with notches at 6 inches, 8 inches, 10, 12, 14 all the way up to 28 inches. 28 inches is the standard for draw length and while I personally draw to 30 I am not worried about it. 28 inches will serve my purpose. Your tiller stick does not need to be fancy. But it does need to work. There are many different designs of tillers and it does not really matter which design you use. The designs all have their pros and cons. I chose my design above because I wanted a tiller that could be used for making both wide and thin handled bows (for thinner handles I can use shivs to keep the bow in place in the rectangular bit). My design also allowed for a member centered position relative to the bow string. Again, as long as it works that is the most important thing. During the tillering process you will want to make sure the bow is bending properly. See the illustration below to see what I mean about correct bends and wrong bends. You want them both to be bending evenly and a goodly amount. Be careful to not trim the wood too thin or it will bend too much / unevenly and will be more likely to bread. A well tillered bow will shoot arrows more evenly and accurately. More bow making posts to come. 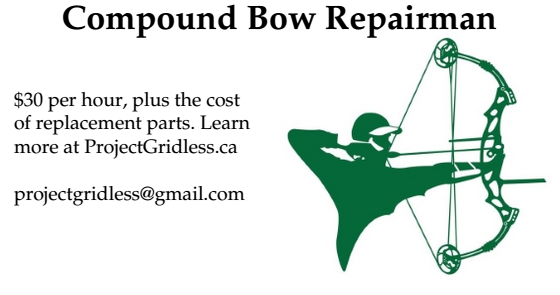 Please subscribe to Project Gridless if you want updates on my bow making projects.